This article is about Kamek's henchmen from the Yoshi's Island series. For the frog-like enemy from Super Mario Land 2: 6 Golden Coins, see Bopping Toady. Not to be confused with Toad or Toad (species). Toadies are enemies first appearing in Super Mario World 2: Yoshi's Island. 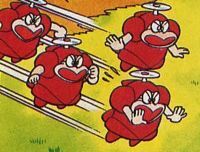 They usually travel in groups of four and are usually depicted as followers of Kamek the Magikoopa, who they somewhat resemble. They have propellers on their heads and are normally dressed in red, causing them to also somewhat resemble Fly Guys. The word "toady" means "underling" and its use does not always refer to Toadies as a species, one such example being Fawful referring to himself as one in Mario & Luigi: Superstar Saga. The groups of red Toadies have not been seen to directly attack and, save for in Yoshi Touch & Go's Time Attack mode, cannot be attacked themselves. However, in the final boss battle of Super Mario World 2: Yoshi's Island, it is possible for Yoshi to shoot down Toadies with eggs if they are thrown directly upward. A group of Toadies kidnapping Baby Luigi. In Yoshi's Island, a group of four red-cloaked Toadies, called Kamek's Toadies, appear in order to kidnap and carry Baby Mario away if Yoshi allows him to float free for too long. There are also the seldom seen Solo Toadies; green ones are able to swipe Baby Mario if he falls off Yoshi's back, and a dark pink variety is able to swoop in and seize the baby immediately after he is dislodged from Yoshi. Unlike Kamek's Toadies, Solo Toadies do not fly off immediately but instead hover around with Baby Mario, making it difficult for Yoshi to get him back. In Yoshi's Story, the Toadies carry Yoshis off to Bowser's Castle if they are defeated. However, if the player rescues a White Shy Guy in one of the levels and completes it, he will be able to save one captured Yoshi, essentially making him the equivalent of a 1-Up Mushroom. They also are seen in the ending, where they help out Baby Bowser after he is defeated by one of the newborn Yoshis by carrying him out of the castle in a similar manner to how they carry defeated Yoshis. 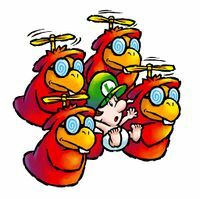 In Yoshi Touch & Go, Yoshi must stop the Toadies from stealing Baby Luigi in Time Attack mode by throwing eggs at them. The four red Toadies (each of which has two hit points, giving the group a total of eight) carry Luigi at the top of the screen, shielded by a group of many purple Toadies who can each absorb one hit. If Yoshi manages to break through the purple Toadies and defeat the red ones before the time runs out, he can save Baby Luigi. 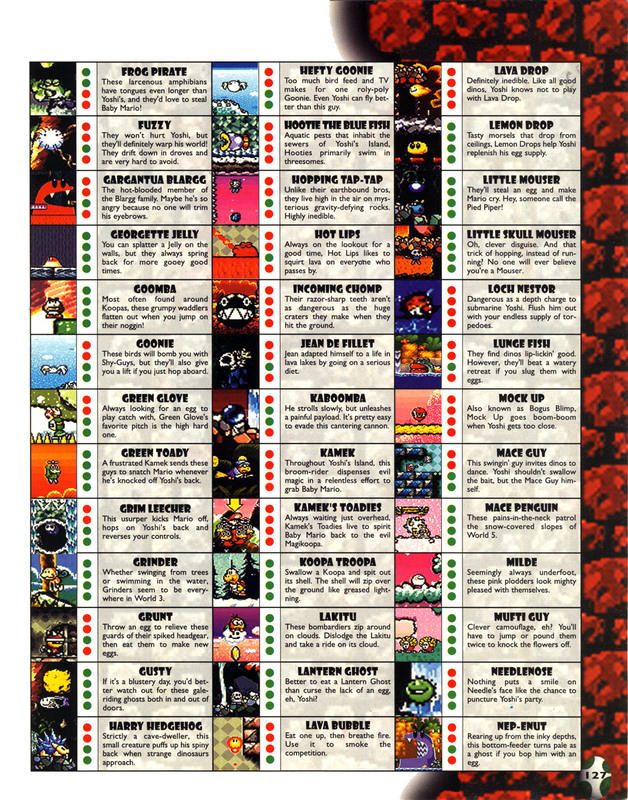 Small, green Solo Toadies also appear as generic enemies in Yoshi Touch & Go; rather than following a determined path, they instead make a beeline for Baby Mario or Yoshi. The Toadies reprise their role in the direct sequel to Yoshi's Island, Yoshi's Island DS. Serving Kamek, who has traveled back in time, the Toadies kidnap babies from all over the Mushroom Kingdom, including Baby Mario and Baby Peach. However, the latter two's captors are attacked by the Stork, who saves them from being kidnapped. Toadies also appear in the mini-game Scratch and Match, which is featured as a bonus challenge in Yoshi's Island and Yoshi's Island DS. Toadies appear in Yoshi's New Island. They are again assisting Kamek and help him kidnap Baby Luigi and the Stork in the game's intro. Although they do not appear as regular enemies that can be defeated, they do appear when Baby Mario is separated from Yoshi for too long and take the baby to Baby Bowser's Castle, making Yoshi lose a life. Solo Toadies reappear, now depicted as having ordinary-colored skin and purple robes. Green ones, however, do not. Some Toadies seen in "Mario in Mariozilla." Toadies once more appear as Kamek's assistants in the Club Nintendo comic "Mario in Mariozilla." They help him invade Mario's garden, but when his plan to shrink Mario fails, they flee. The Toadies are later seen during a fight between Mario and Kamek, supporting the Magikoopa. After Kamek and Mario get shrunk by the abilities of the Magikoopa's broom, some Toadies work together with Dr. Light and Princess Toadstool in order to transform their master back. In this comic, Toadies look different from their appearance in the games: their actual eyes and pupils are visible behind their glasses, rather than just the spiral form, their characteristic teeth are missing, they wear armor with round short sleeves instead of their usual robes and they possess fingers. The orb item depicting a Toady in Mario Party 5 is incorrectly labeled as "Magikoopa Capsule". When a player uses this capsule, the player will swap their capsules with another player's capsules. The player chosen is determined by a roulette. The orb from Mario Party 5 reappears in Mario Party 6, now correctly named the "Toady Orb". Using it places a trap on the board that steals an orb from any player who lands on it, giving the orb to the player who set the trap. In Mario Party Advance, one of the missions includes Mario or Luigi helping a group of Toadies named the Kamek Krew find a stage for them to perform at. The ending states that the concert was a huge hit. Toadies also appear in the minigame Broom Zoom, although similar to their appearance in Mario Party 5, they are incorrectly labeled as Magikoopas once again. A Toady, selling candy to Mario in Mario Party 8. In Mario Party 8, Toadies run the Candy Shops in Bowser's Warped Orbit, one of the Toadies drives Bowser's convertible which appears when someone lands on a Bowser Space in Koopa's Tycoon Town, and two of them hold the 7,000 points sign in Test for the Best. Many Toadies appear in Mario Party: Island Tour in the Kamek's Carpet Ride board. They can be seen bustling about the library area. They also assist Kamek in moving characters forward or backward a number of spaces when he uses Kamek Time. In Super Mario Party, Toadies (now called Magikoopas in the British English version of the game) appear during tutorials holding a scroll which shows images related to the tutorial. They also appear in Kamek's Tantalizing Tower, where they carry players who land on Event Spaces to a different space, and host an item shop. However, the item shop run by Toady in Kamek's Tantalizing Tower forces the player to buy an item, which is limited to the choices of a Dash Mushroom, Poison Mushroom, or Custom Dice Block. In Challenge Road, if the player fails to complete a minigame challenge three times in a row, a Toady will fly down and offer the player a chance to skip the challenge. 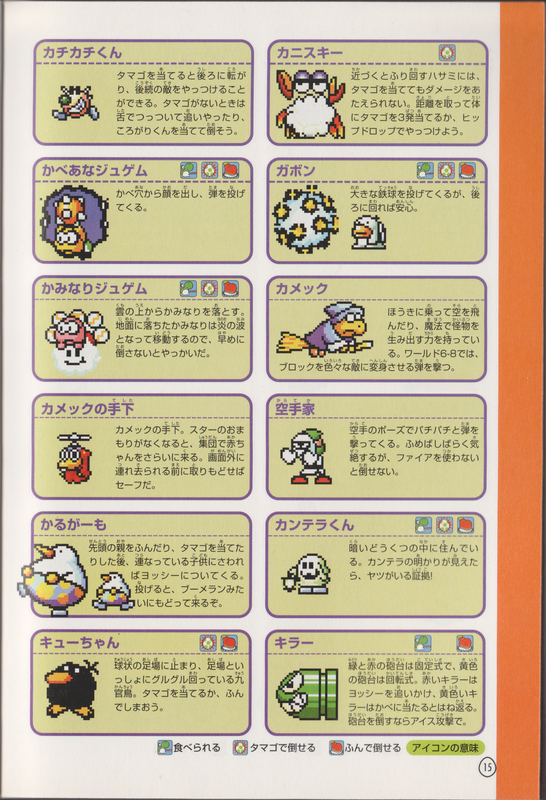 In this game, they all wear brown shoes instead of being barefoot and have fingered-clawed hands much like Kamek. When speaking to Bowser and Bowser Jr. they have special dialogue for them. In WarioWare Gold, Toadies appear in a microgame Yoshi's Island, if Yoshi does not catch Baby Mario before time runs out. In Super Smash Bros. Ultimate, Toadies make an appearance as a Spirit. Kokamekku Kamek's minions (Kamek's Toadies). Little Kamek/Magikoopa (Kamekku is both the name of the character, Kamek, and the species, Magikoopas); shared with Solo Toady. Spanish (NOA) Hechikoopa From Hechicero (sorcerer) and Koopa. Spanish (NOE) Magikoopa From Mago (wizard) and Koopa. Kkomagwi Portmanteau of 꼬마 (kkoma/kid) and 마귀 (Korean name of Kamek). "Toadie" was used as the nickname for the character of Toad by characters like Mario in the Nintendo Comics System series. Also, Princess Peach, when she was known in the West as "Princess Toadstool", was referred to by the nickname "Toady" in a German Club Nintendo comic. In Tetris Attack, though they solely appear as part of the background image for Kamek's window, Kamek does announce them when he appears in the Cave of Wickedness. The boss fight of Prince Froggy's Fort takes place in the stomach of Prince Froggy, yet the Toadies still appear to abduct Baby Mario if Yoshi is harmed and unable to retrieve the lost baby. ↑ BeardBear. (October 5, 2018). Super Mario Party: Walkthrough Part 4 - Kamek's Tantalizing Tower (4 Players Gameplay). YouTube. Retrieved: October 6, 2015. This page was last edited on March 16, 2019, at 17:19.